Note that in two of these situations, removing loose impediments and addressing the ball, the player will still incur a penalty if they press down on their line of putt while doing so. Does it follow that when a player is repairing ball mark damage on their line of putt they must not finish the repair by tapping it down with their putter head, or their foot? The answer is no. There is no restriction in Rule 16-1c as to how a player repairs damage that has definitely been made by a ball. For many of us that may include pressing down the area, to ensure that the surface is flat following the repair and so will not subsequently divert the roll of our ball. When the player’s ball is on the putting green, the player, his partner or either of their caddies may, before but not during the stroke, point out a line for putting, but in so doing the putting green must not be touched. A mark must not be placed anywhere to indicate a line for putting. So, the player, their partner, or either of their caddies must be careful that they do not touch anywhere on the intended line of putt, whether it is with a hand, a foot, a club, or a flagstick. But once again there is an exception; Decision 16-1a/12 clarifies that if a player walks on their line of putt, there is no penalty if they did so accidentally and their line was not improved. I covered the definition of Line of Putt in this earlier blog; it is not always a straight line between the ball and the hole. If there is a stroke-play play-off between two competitors and one of them is disqualified or concedes defeat, it is not necessary for the other to complete the play-off hole or holes to be declared the winner. Sign up for my free, weekly 'Rhodes Rules School' photo series emails at this link - a more enjoyable way to understand the Rules of Golf. Barry, i see many players walk up to about 10-15 feet from hole when they have long putts and try to figure out the last break, typically standing on or close to the line of their putt, is this touching the line with their foot? There is only a breach if the player is intentionally trying to improve their line of putt. As I said in the last paragraph, "Decision 16-1a/12 clarifies that if a player walks on their line of putt, there is no penalty if they did so accidentally and their line was not improved." Apologies if this isn't really the correct thread, I couldn't find an exact match. Its a pretty trivial query anyway. Its to do with pressing your ball down on the green, which I know is not allowed. If a player feels he may have inadvertently put some downward pressure on his ball in replacing it on the green, or perhaps in getting it onto its exact spot if it toppled a few mm, or lining up the logo or something, is this something that's worthy of a penalty or does the fact that there's no intent to alter the physical conditions (as mentioned in the decision D1-2/9) get him off the hook ? I would have thought its virtually impossible for there not to be some tiny amount of downward pressure in the act of placing, but my playing partner insisted on penalising himself just in case. In my opinion, a player who thinks they may have inadvertantly pressed down their ball while replacing it can simply lift their ball (presuming the marker is still in place) and replace it again without any downward pressure. In the unlikely event that the player thinks they may have changed the lie of the ball while originally replacing it on the putting green, they can restore that 'damage made by a ball' to its original state and replace the ball without penalty. 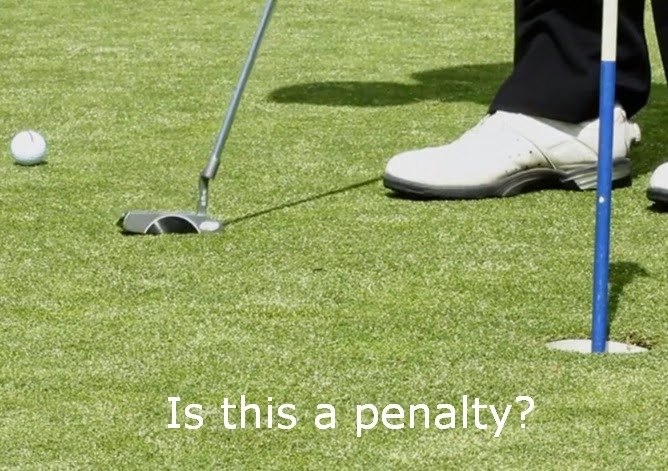 A penalty would only apply if the player purposely pushed their ball into the putting green, e.g. to improve their lie by flattening an imperfection on the surface.